I got up at the usual time and hovered around for a bit waiting for the rain to stop. No luck so I found a spot on the balcony for some exercise and went down for breakfast. I had a bit of a Skype meeting and then got my stuff ready to go into Beijing for a few days. Shen drove Justin and I to Hoairou and organised somebody to drive us into town for 200 Yuan. We got to the Inner Mongolia Grand Hotel and decided to eat lunch before anything else, there was an amazing buffet with everything from pigs ears to Sashimi so we filled up and then dropped our stuff into our rooms. It’s a bit of a fancy place but I kind of messed up the booking a little and we each have a twin room with two single beds, boooooo! I had a nap and we headed out to see some galleries that I’d found online. After wandering around for ages it turned out that Google maps had sent us to a spot 15km short of the gallery, damn you google. 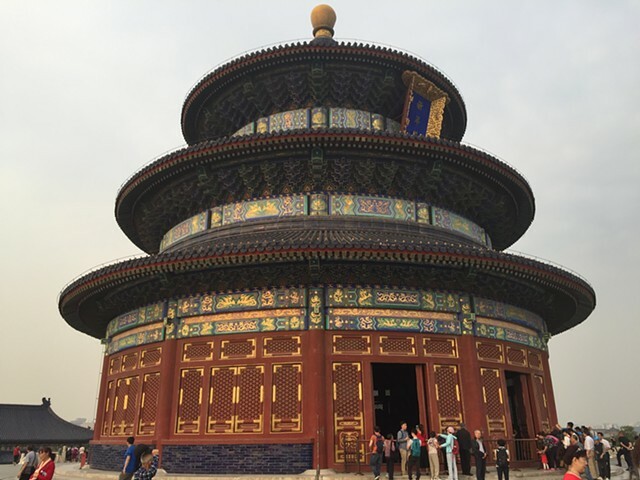 We walked for ages to visit the Temple of Heaven which was full of lush parkland and clusters of locals playing cards, badminton and Mah Jong. Afterwards we found a car to drive us back and the guy got a bit lost and flustered, this place is so big that even the locals get stuck lost. After another hotel break we went to meet Tianzhou Chen for dinner in a hutong a few subway stops away. The subways are really straightforward and it turned out being an easy process getting there. We ate at an awesome Vietnamese place and wandered around for a bit before heading back to the hotel. I was in a show that opened in Perth tonight, Invisible Genres at John Curtin Gallery, I hope it all went well.